What is a DD Form 1172-2? The DD Form 1172-2 form will allow someone to enroll their dependent, such as a spouse or child, in Defense Enrollment and Eligibility Reporting System. Dd Form 1172 2: What Is It? The DD Form 1172-2 form is used by the Department of Defense in the United States. This form is known as an Application for Information Card and DEERS Enrollment. DEERS stands for Defense Enrollment and Eligibility Reporting System. This form will allow someone to enroll their dependent, such as a spouse or child, in DEERS. 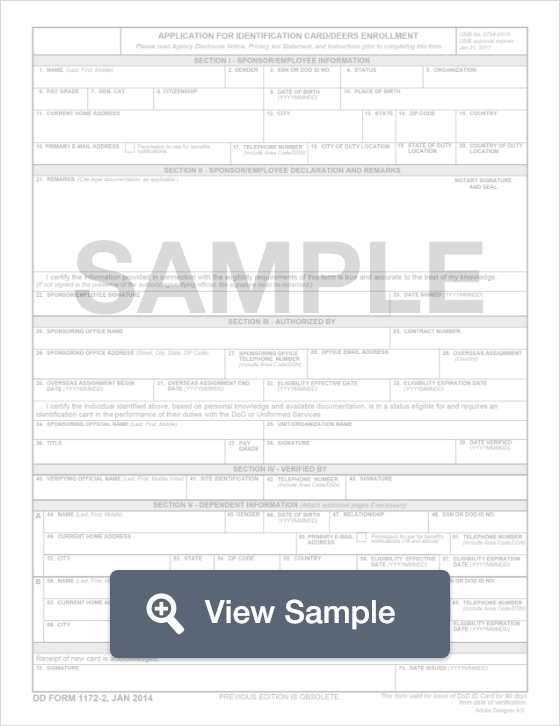 This form will require personal information for both the dependent and the government employee. This includes their full name, address, social security or identification number, and contact information. Both parties must sign the form in order for it to be completed. Failure to include all the required information could lead to the application being delayed or denied. Create a free DD Form 1172-2 in minutes with our professional document builder.